Click here for detailed information for your accommodation. A free Transportation Pass can be picked up at the Transportation Desk located in the Registration Area. The Hola BCN travel card includes metro service travel between the airport and Barcelona city centre. At the airport, if you do not have a Hola BCN travel card, you need a Bitllet Aeroport which costs €4,50-€5,00. This ticket is available at the Metro desk or any of the ticket machines. Once you collect your transportation pass at the congress, you can use this to travel within Barcelona, and for travelling to the airport. Metro Line 9 Sud connects the airport terminals T1 and T2 with the city of Barcelona, every 7 minutes. Exit at the Fira for Hall 8. Barcelona allows easy travel by metro, bus or taxi. The city currently has eight metro lines. Here is some travel advice on how to get to the congress venue Fira Gran Via, hall 8 via public transport. Line 10 (light blue) and Line 9 (orange). From Plaça d’Espanya, please take the Line 1 to Torrassa. Change to Metro Line 10 Sud and exit at the last stop FOC. This is the nearest metro station to Hall 8 of the Fira Gran Via. It is a 5’min walk to the entrance of Hall 8 (North Entrance). Another option from Plaça d’Espanya would be the Line 8 to Europa Fira. 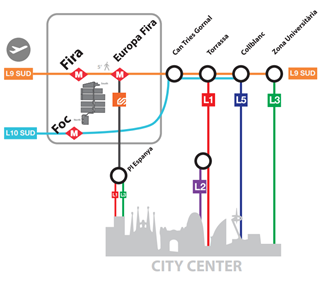 Change to Metro Line 9 Sud and exit at the stop Fira (and NOT Europa Fira). From there it is a 6’-8’min walk. From the airport, you need a Bitllet Aeroport which costs €4,50-€5,00. This ticket is available at the Metro desk or any of the ticket machines. The Hola BCN travel card includes metro service travel between the airport and Barcelona city centre. Metro line Line 9 Sud connects the airport terminals T1 and T2 with the city of Barcelona, every 7 minutes. Exit at the Fira stop for Hall 8. From Pl. Espanya – FGC you can take line 79 to Av Carrilet – Vigo. Exit at Alumini – Foc. This will take you straight to the entrance of Hall 8. However, it is recommended to take the metro instead of the bus. There are more than 10,500 taxis in Barcelona and its metropolitan area, easily identifiable by their yellow and black appearance. The Fira Barcelona venues have taxi ranks laid out to facilitate the arrival and departure of visitors. Ask the taxi driver to take you to Fira Norte, Hall 8, located on Carrer del Foc (Foc street). All the taxis have a green light to indicate their availability, a visible taximeter displaying the amount to be paid, either with cash or credit card. Fira Gran Via has parking around its venue.